The rally in Gurdaspur was part of the BJP’s campaign to hold PM’s 100 rallies across the country ahead of the Lok Sabha elections. 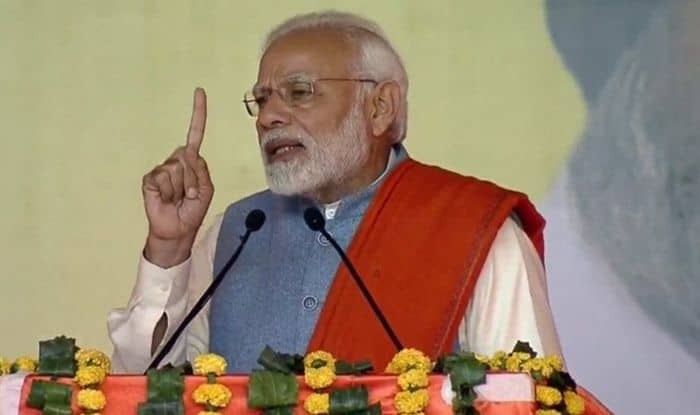 Gurdaspur: Prime Minister Narendra Modi on Thursday launched a scathing attacking on the Congress, holding the then party leaders responsible for the 1984 anti-Sikh riots. He also attacked the Grand Old Party over the issue of farm loan waiver. In a veiled attack on Madhya Pradesh Chief Minister Kamal Nath, PM Modi, addressing a rally in Punjab’s Gurdaspur, said that the Congress is awarding CM post to those who are accused in the anti-Sikh riots. “People of Punjab need to beware of who have a history of killing thousands of Sikhs, those who are awarding CM post to riot accused,” he said. “The country wants Congress leaders punished for 1984 anti-Sikh riots,” he added. Referring to former Congress leader Sajjan Kumar’s conviction and sentencing to life imprisonment in connection with the riots case, PM Modi said that the erstwhile UPA governments had shielded the accused, but the NDA government formed an SIT to probe the cases. “On one family’s direction, the files of those involved in the riots were put under wraps, but the NDA dug out these and set up a SIT and results are before you,” PM Modi said. He said the NDA government took a historic decision to build the Kartarpur Corridor, which will link Dera Baba Nanak in Gurdaspur to Gurdwara Darbar Sahib in Kartarpur in Pakistan, the final resting place of Sikhism’s founder Guru Nanak Dev. PM Modi also attacked the Grand Old Party over the issue of farm loan waiver. The Congress had made tall promises to farmers on loan waiver, but later deceived them, he said at a rally. PM Modi said the Congress in Punjab, too, had made big promises to farmers, but deceived them after coming to power. Earlier today, PM Modi inaugurated the 106th edition of the Indian Science Congress at Lovely Professional University (LPU) in Jalandhar.